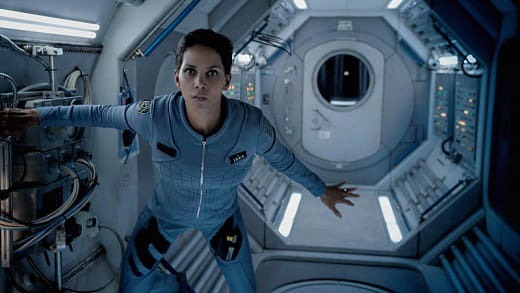 It becomes pretty clear early on in Extant Season 1 Episode 1 that things are not going to go well for Molly Woods upon her return from a 13-month space mission. That's probably not the half of it, because we're treated to a whole lot of mysterious circumstances in the series premiere. Interestingly, the Steven Spielberg-produced drama decides against putting anything out there to help guide us on our mission to understand the unfolding events by leaving out the whens and wheres of Extant. Judging by the futuristic trash receptacle outside Molly's house and the seemingly privatized space program, ISEA, she works for, we aren't quite there yet in the real world. When are we? I don't know and I'm not sure it matters. It intensifies the thriller, rather than detracts from it. Molly is acclimating to her return from space a little awkwardly. She's tense and introspective. She has a difficult time re-engaging with her husband, John, and their son, Ethan. Ethan is not an ordinary little boy, but an artificial intelligence being they call "humanix," something Spielberg has had run-ins with before. Please note, humanix could be humanics or anything else -- I'm flying blind! I chose the "x" ending to make it less human. Apparently I have AI issues myself. Molly's situation is immediate. She's vomiting before a party, causing Ethan distress that she may not be able to attend. She learns she's pregnant after a routine return-to-earth exam. Neither she nor her doctor, Sam, understand how this is possible, but Molly is hiding the details of a 13-hour (13 is obviously the number of choice here) chunk of space time from mission control. In various flashbacks we learn Molly was visited on the craft by a vision of her former lover (no details other than her gazing at their photo when John walks in) who died long before she married John. Marcus appears to her asking for help after her craft has an electrical issue and she, as you would, invites him aboard. Alright, perhaps the rest of us would run for our lives if faced with a dead man in outer space, but not Molly Woods. She lets him in, he seduces her and when she wakes up 13 hours later to find him gone, she replays the video, discovers she's alone and erases all evidence of that 13 hours. In other sci-fi productions, aliens appear to humans in forms they understand and would easily accept. That seems to be the case here. Molly was barren, and now she is not. Thanks to an alien. Perhaps. John wants to make little Ethans to solve fertility issues and because he believes in the idea of humanix. When he presents his son as the humanix he is, others question what fail safes such beings would come equipped with. He asks what fail safes they have installed in their own children. Not having children has affected John and we can guess when he learns Molly is pregnant, all will not be well. The length of time Molly was away was just enough to make her question Ethan. Ethan can grow and evolve, but she's no longer sure that's such a great thing. When he and Molly have an argument at a park, he runs off and she finds him standing next to a dead bird. Ethan found him like that, he claims, but if he can evolve, he probably also knows that being near the bird would frighten her. Staying there is a warning to Molly. Ethan isn't going to take the pregnancy well, either. As if that wasn't enough of a stretch for the first hour, there is also the case of the suicidal astronaut who came before Molly. After a similar mission, he committed suicide. Or not. Molly starts getting strange messages and sees lurking men in the street. We learn later the lurker is Harmon Kryger, believed dead. He has a warning for Molly not to trust anyone and by this point it seems sound advice. Halle Berry is a beautiful and talented movie actress and she's the big draw, beside Spielberg, of the series. Kryger is played by Brad Beyer who has a knack for empathetic roles (and will forever be known for Jericho in my mind) and I'm looking forward to his story and how he and Molly interact. The space program where Molly works is onto her lies -- they don't believe for one minute someone as capable as Molly would allow 13 hours of video to be lost from all cameras by accidently deleting it. They'll be keeping a close eye on her, by way of (a newly regenerated?) Mr. Yasumoto, to who's corporation it was that John presented Ethan. By funding John's project himself, he can keep an eye on Molly. We can only guess that they had something to do with Kryger's "death." When they discover Molly's predicament, will she be next? Molly finds herself in the unenviable position of being the focus of scrutiny from every direction. Her job, her doctor, her husband and her humanix child for starters. Kryger will be watching and waiting for a good time to talk while, perhaps, protecting her if he can. Have the aliens (assumption!) kept track of their little spawn? They wouldn't be worth much if not. It should be fun to see where it goes and how it separates itself from the many similar projects that came before it. It could be that Berry's Molly will be all that's needed to keep viewers tuned in. The premiere threw a lot of information our way; now we get to see where it lands. So what did you think? Are you interested in the potentially evil humanix, the possibility of alien life or the mystery of Harmon Kryger? How would someone really know what happened to Molly? What is the point of the space program? Hit the comments and give us a shout! We have a new commenting system, so your excitement is our excitement! Grade it old school. Extant - thumbs up or down? One Thumb Up! Two Thumbs Up! Mixed - One Thumb Up and One Thumb Down Thumbs Down!